We were delighted to receive a Silver Gilt award again this year. The judges were very impressed with the transformation of the Sensory Garden at the Community Centre. Special congratulations to Victor de Garis who received a personal award in recognition of his long service to the Parish. We are very grateful to all our sponsors, a full list can be viewed here . As part of the Floral Guernsey Community Competition we have to submit a portfolio showing what we have been doing over the last 12 months. Please click portfolio 2014 to view. 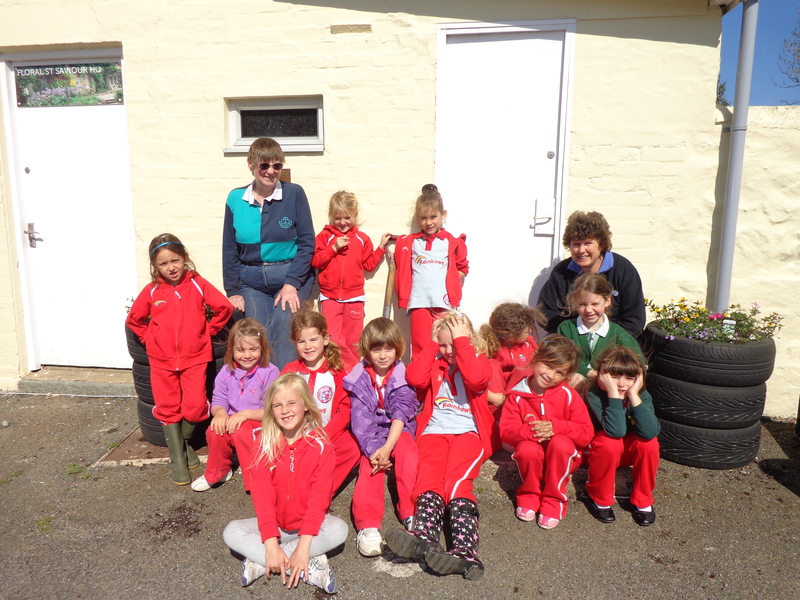 We were delighted that the Rainbows were able to plant out the recycled tyre planters at the Community Centre this year as part of their planned activities. They enjoyed looking at the developing Sensory Garden and playing on the grass afterwards. In addition, we welcomed a team from the Community and Environment Employment Scheme (CEPS). They have carried out work around the grounds of the Community Centre as well as helping inside the building. 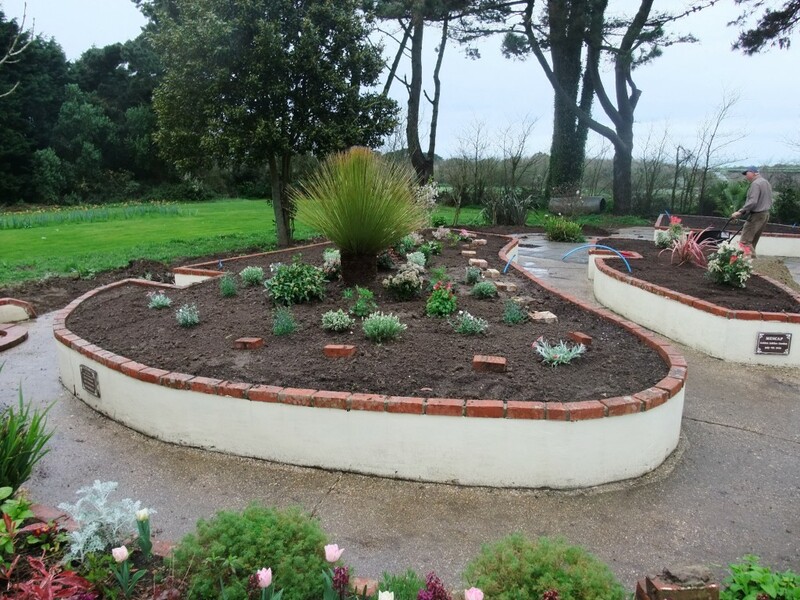 Some of the many tasks they have completed are rendering and painting the formal bed planter and cutting and clearing the hedge to the north of the grounds (at the bottom of the Sensory Garden) which has opened up the beautiful views across the fields to the sea. CEPS do a fantastic job and we are very fortunate to have them working with us. May is an incredibly busy month, as all gardeners know. All plants and weeds are on steroids and the increase in growth rate is phenomenal. Work in the Sensory Garden is constant to keep control of weeds and deadheading. The brick bed by Maylands Nursery has been stripped out, had the soil prepared and been replanted to create a dazzling display to welcome visitors. Similarly, a new wooden planting trough has been installed at the entrance to the Community Centre and planted out to complement the planting scheme in the nearby brick bed. Landscaping the surrounds of the Sensory Garden has been completed as far as possible with the planting of a griselinia hedge. Courtil Sous L’Eglise has also taken a lot of time to stay on top of maintenance. A major objective this year is to control the cow parsley which is invading the field. Twice a week throughout the flowering season a couple of volunteers have been cutting off the heads of any plants in flower to prevent seed production. The bluebell nursery beds have been weeded, as has the living willow bird hide. The pathways are mown weekly, of course. The Sensory Garden planting in the raised beds is all but complete and the irrigation is installed and working. Additional volunteers are starting to carry out ongoing maintenance of the beds. 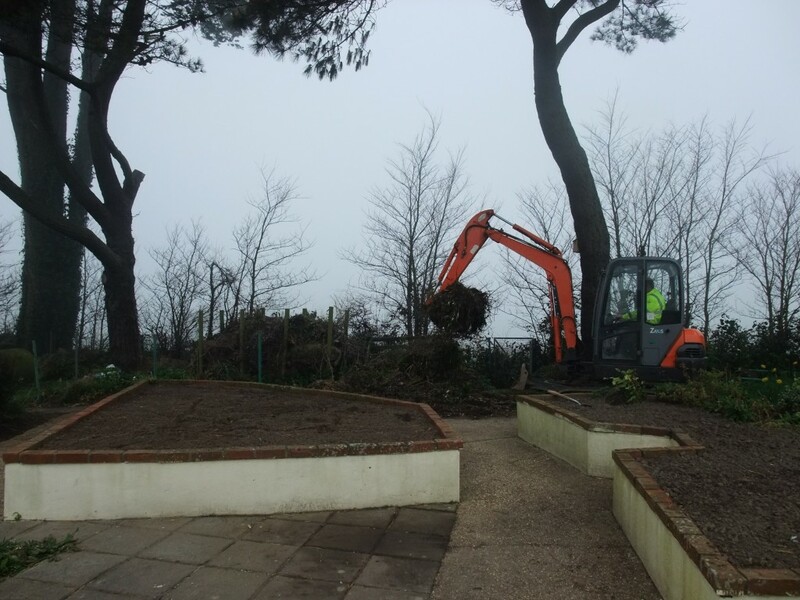 In the meantime, work has started on creating the new pathway entrance and landscaping the area between the Sensory Garden and the car park, seating areas are being incorporated so that people can sit and enjoy the gardens. In the meantime, the Parish field opposite L’Auberge du Val finally dried out sufficiently for us to plant the crab apple and wild pear trees, we have been trying to get in there since mid-December! We found that the row of holes closest to the douit were too full of water to consider planting so we only planted 26 out of 49 holes. The holes were filled with topsoil reclaimed from the Community Centre when additional car parking spaces were created, thanks to Bon Martel for driving the large tractor to make the work easier. 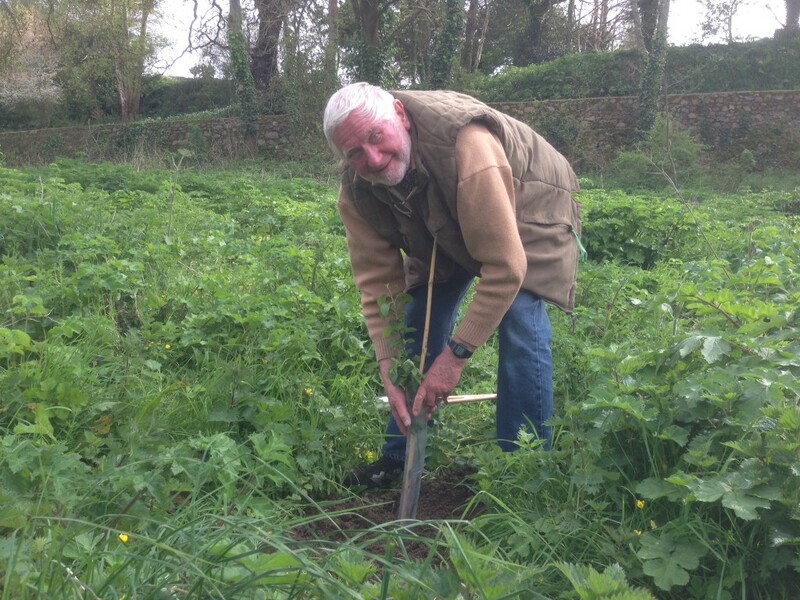 The trees were planted with a cane for support, rabbit protection and organic fertiliser added. 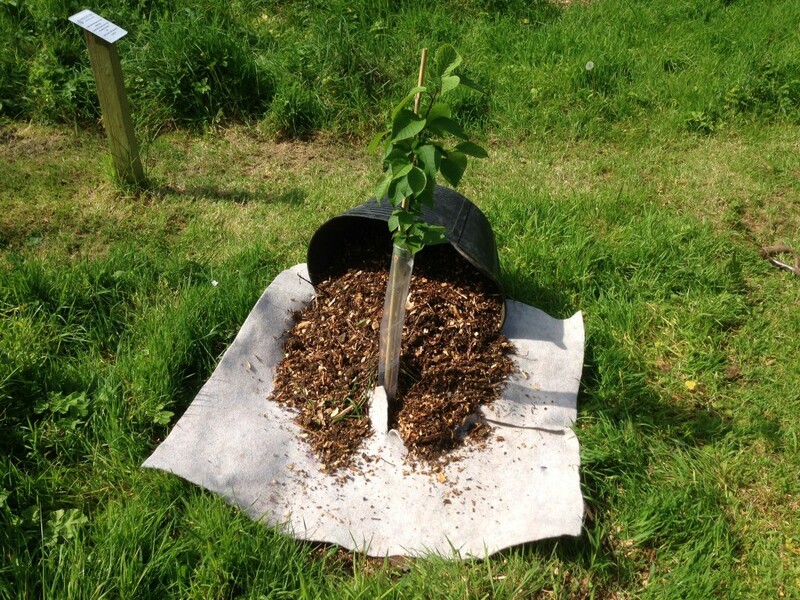 A one metre square permeable membrane, recycled from the Community Centre car park, had slits cut into it and placed around each tree and bark chippings added on top, this should both suppress weeds and aid moisture retention during the summer months. The Bluebells bloomed during the month in the nursery beds. Work on preparing the raised Sensory Garden beds for planting was completed by the end of the month. 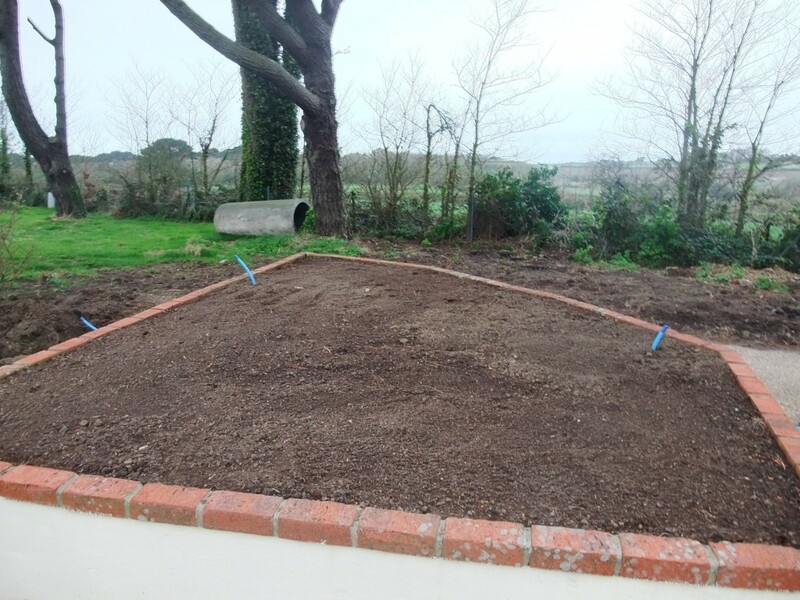 The beds were cleared of perennial weeds, dug over, tilled and raked over. The soil was tested for pH value, adjusted for optimum plant growth and organic plant food was added. An irrigation system is being installed whilst the beds are empty, the water pipes will be buried so they are less obvious to inquisitive little fingers! By the end of the month the beds were ready for planting. The centre pieces of the displays were added, each bed having its own colour scheme which melds together to create a very pleasing tapestry of colour. Already we are attracting bees and other insects into the garden. 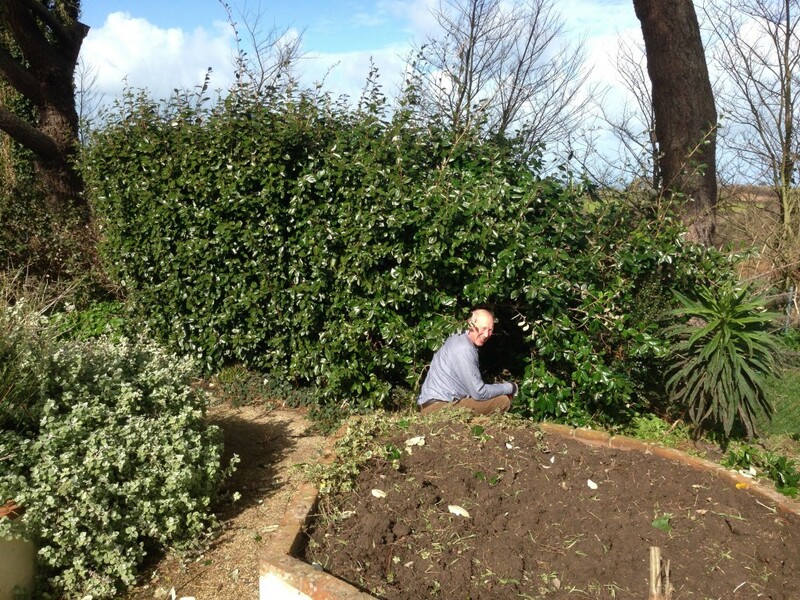 In the meantime, work on clearing the fencing, overgrown hedging and old compost bins was also completed. 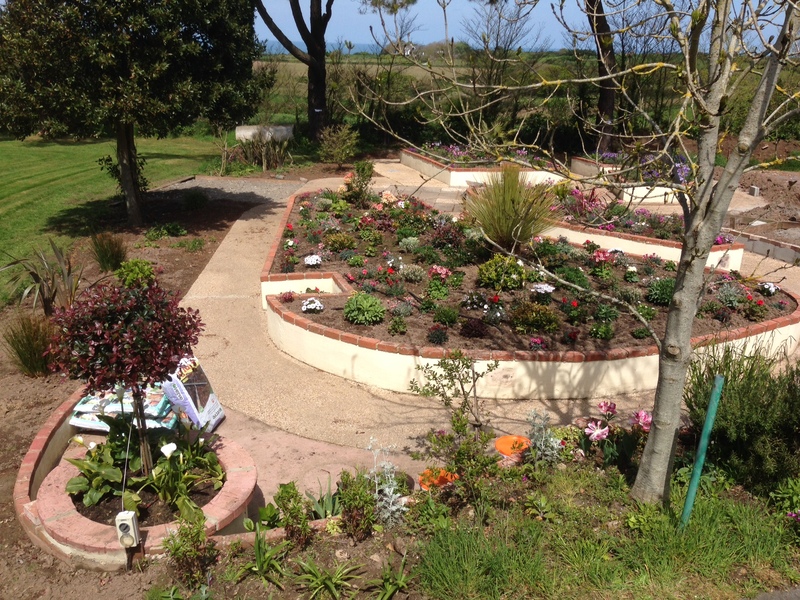 This has really opened up the Sensory Garden and revealed the stunning views over neighbouring fields to the sea. A mini-digger was enlisted to do the heavy work and we filled three large skips with green waste that was taken for recycling. This month has seen the start of our push to master this important part of the judging criteria, representing 50% of the total marks. The Sensory Garden at the Community Centre was reclaimed 3 years ago, it was built to commemorate the lives of 3 pupils at the former Mont Varouf Special Needs school and was sadly left to its own devices once the school moved to Le Rondin. 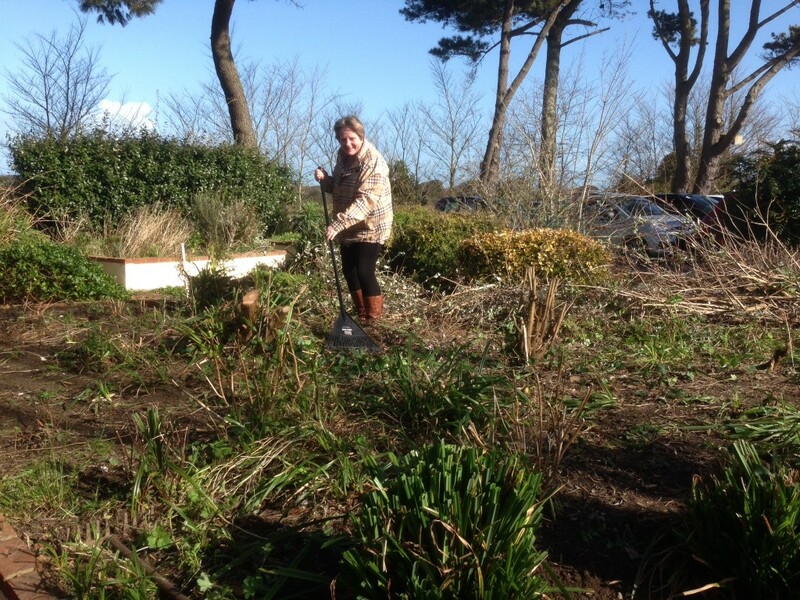 Last year volunteers took responsibility for ‘their’ beds within the garden and were able to plant what they wanted. The Community Centre management have requested that there be access through the Sensory Garden to the field as they wish to attract wedding receptions in a marquee on the field. They have also requested that the Garden be designed with a view to being a setting in which wedding photographs can be taken. The plan has been agreed with the Community Centre and can be seen by following this link Sensory_Garden_walkthrough_plan_140305. This year we have welcomed Janet and Robert to our Group, Janet has horticultural experience and is setting about transforming the Sensory Garden to meet the Community Centre requirements. Our objective is to create a well planned area planted with appropriate plants in appropriate soil conditions. The first step is to clear the Garden of all plants, saving many for re-use, clearing the hedge and removing the unsightly wire mesh fencing. This is a section of the judging criteria which is important to us as rural community. 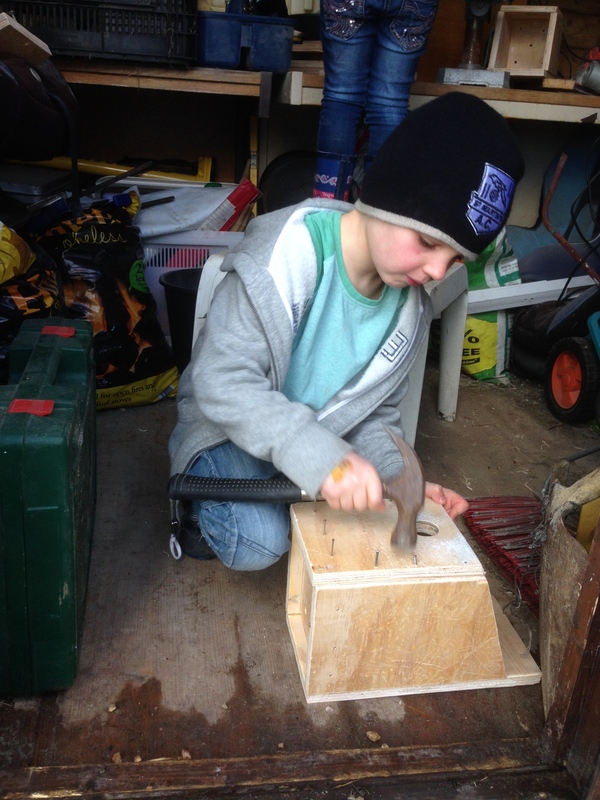 Several bird nest boxes have been made by a volunteer assisted by his grandchildren, these have been installed at the Community Centre. 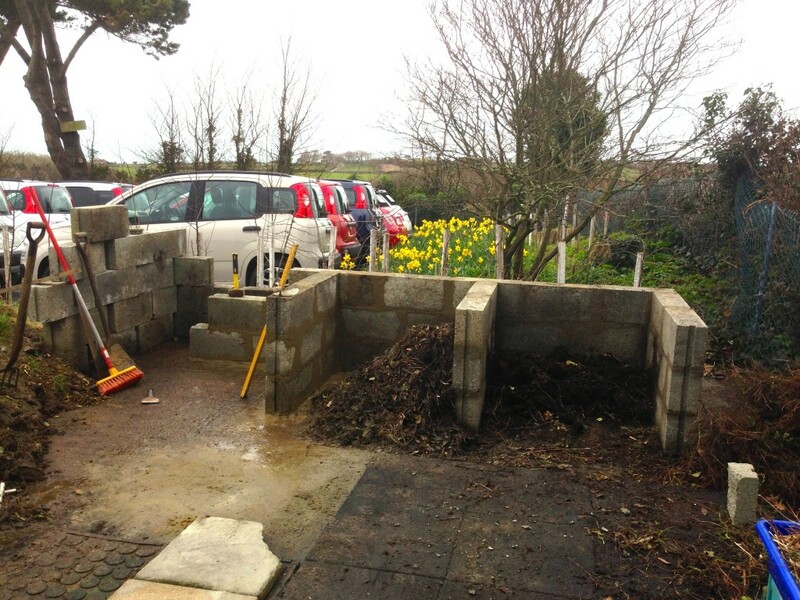 We have also started building 7 permanent compost bins in the Plant Nursery area at the Community Centre. The plan is to shred green waste and place it in the first bay then a week or so later to turn this waste into the bin next door so freshly shredded waste can be placed in the (now empty) first bin. The next week the contents of bin 2 will be turned into bin 3, the contents of bin 1 into bin 2 and freshly shredded waste placed in bin 1. This continues until bin 7 contains compost ready to use. 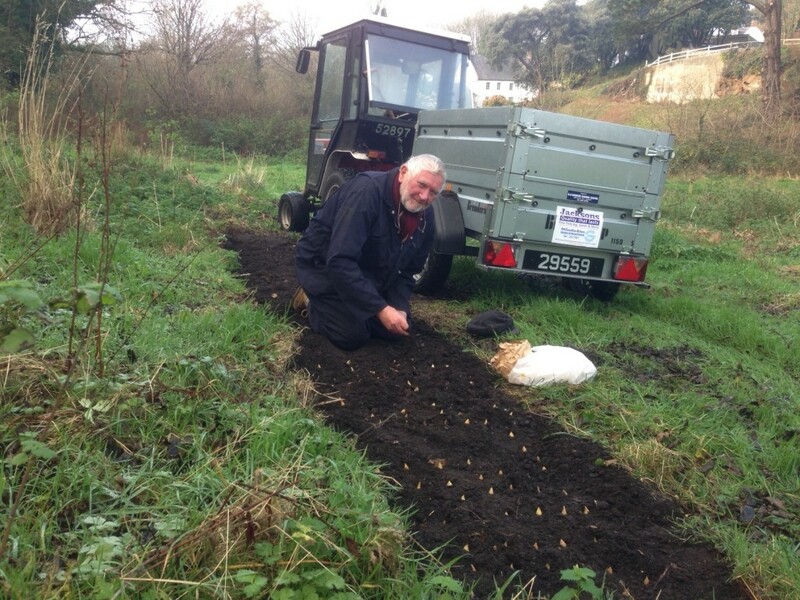 We acquired 2 trailer loads of leaf mould compost from Parks and Gardens (thanks Phil and co!) which used to fill the trench prepared in October for the third Bluebell nursery bed. We planted 1,500 corms. We had intended to fill the 49 holes for the Crab Apple trees with soil stockpiled at the Community Centre but then the rain and gales set in and didn’t stop for the rest of the month. 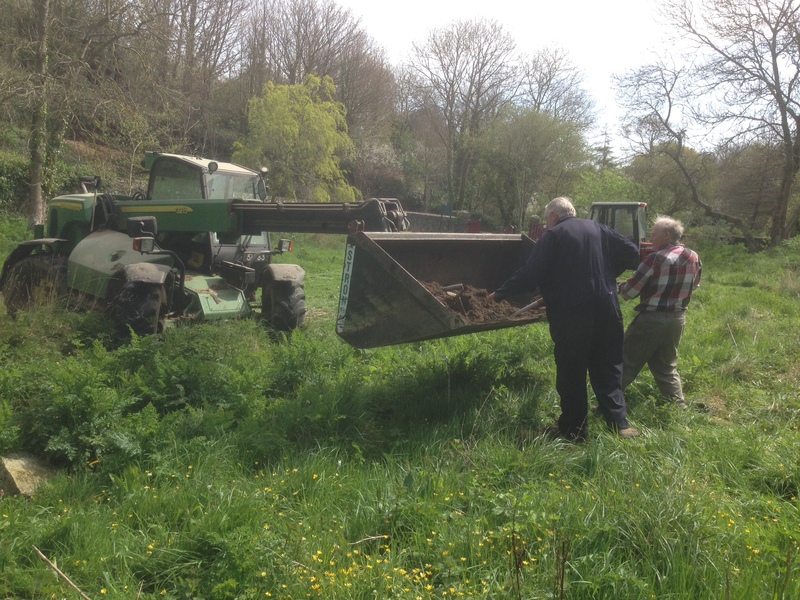 This month we have started working on the ‘Wood’ part of the Bluebell Wood project in Courtil Sous L’Eglise. We plan to plant 50 Crab Apple trees on the south side of the meadow in early 2014, the trees are to be supplied by the Green Legacy Project. 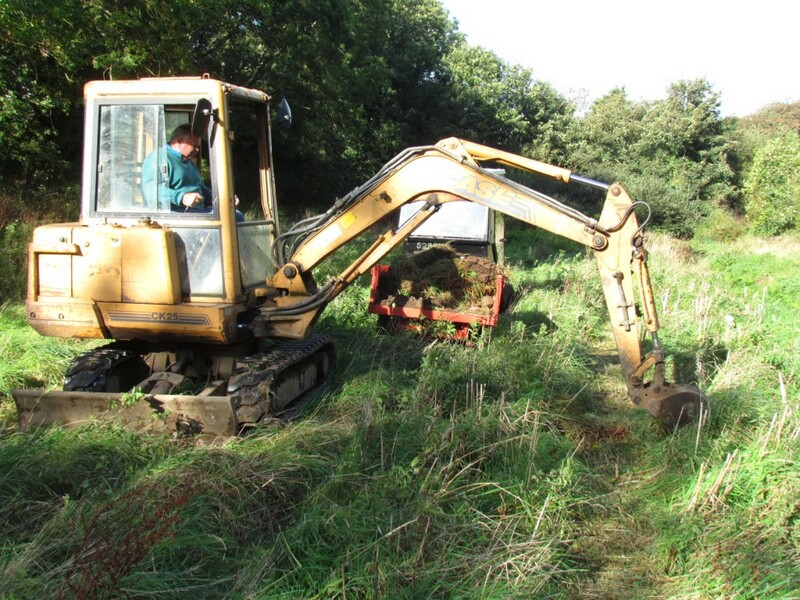 Our experience of creating the Bluebell nursery beds over the last 2 years led us to seek sponsorship in the form of a mechanical digger to create planting holes for the trees. This meadow took the spoil from the nearby German Tunnels, built during the Occupation, that run under St Saviour’s Church. There is very little topsoil (average of about 40mm) and there are large rocks buried below along with smaller spoil. We were delighted that Island Construction Limited agreed to supply a digger and the owner of the company, John Wild, personally operated it. Vic de Garis and Andrew Courtney worked with John for 4 hours one Saturday morning to dig the holes and also create the third, and final, Bluebell Nursery bed. The holes will be filled with re-cycled compost provided by Queux Patio Plant Centre which should give the new trees a good start in life. Also in Courtil Sous L’Eglise we took another step forward with the plan to create a second entrance/exit in the North West corner. Corporate sponsor Dunnell Robertson Partnership has drawn up plans, incorporating the levels survey conducted by Corporate sponsor Marquis Surveys, for the entrance and associated earth ramp and landscaping. A pre-application meeting was held with the Environment Department to discuss the plans as a result of which some minor revisions will be made and a final pre-application meeting held. Congratulations to Ed, Florrie and Felix Cooper who win the overall competition – and the Shield! We hope you will enter next year ! We are delighted to have received a Silver Gilt Award for the second year running. The judges’ feedback after the Awards Night gives us every encouragement that we can achieve a Gold Award. A very big thank you to the band of about 12 people who have worked so hard throughout the last year. We need more volunteers though, if you think you can help, perhaps by agreeing to do an hour a week to suit you for a specific task that would be your responsibility and that you can take pride in then please contact Andrew Courtney 07781 105606 or email andrewcourtney@newtelsurf.com . Please note the correct eMail address to which you should submit results is sunflowersssv@yahoo.co.uk . Good luck! There has been a substantial increase in activity over recent weeks and all the plans are coming together. The Community Herb Bed looks almost good enough to eat (well, that’s the idea!) but has attracted unwelcome attention from long eared guests that have nibbled the plants to stalks – anti-rabbit measures are being taken. The Plant Nursery has a heap of re-cycled compost for use around the grounds and the screening hedge is flourishing. The ground between the trees has been weeded. Cuttings were taken during the planting of the formal bed and these are now in residence. The formal bed has been planted out and now needs a bit of time to fill out and fulfill its promise. It is a pity the rendering was not completed but we can’t have everything. The Brownies have planted their re-cycled tyre planters outside Floral St Saviour HQ. The Information Board will be installed shortly. The hanging baskets were safely collected from Herm Island where they have been planted up and looked after – thanks Brett and Rosie. We were lucky with the weather during the collection, it must have been the only day for three weekends that there has been no wind. The baskets look stunning but have had to be taken down during the gales of the last weekend for protection. The Maylands Nursery play area has been weeded and swept. The trees have been cleaned and this former problem area looks well cared for. The daffodils have died back on the field and this planting area has now been mowed and brought back into use. The wildflower borders are starting to grow at long last. Sadly, these are proving very slow to grow. Perhaps this is because it is the first year of cultivation? The same seeds were used as for the Community Centre and Courtil Sous L’Eglise, the latter are developing particularly well. The Willow Hide has been repaired. The fallen pine has just been removed, plants in the field have been flattened during the operation but hopefully will spring back before judging. The workmen did an excellent job of clearing up and causing the minimum amount of disturbance. 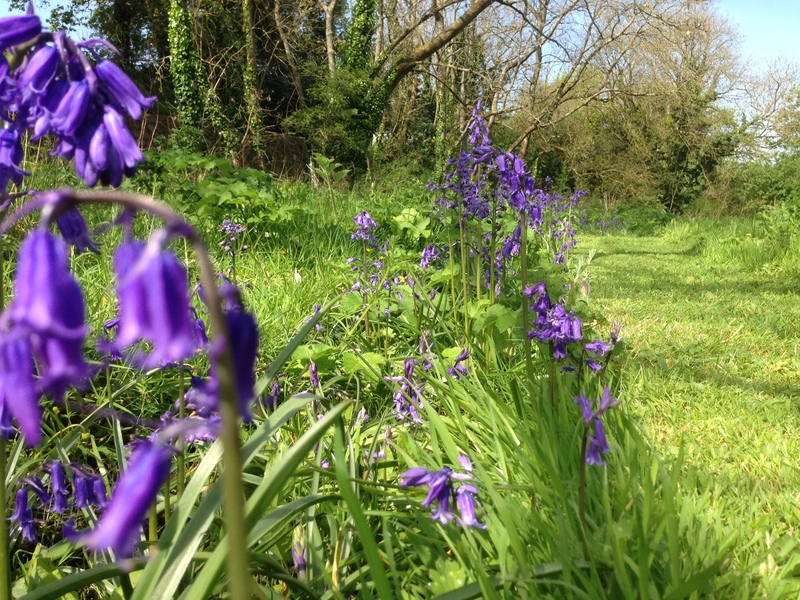 The Bluebell nursery beds have been weeded and the Bluebells are dying back. The wildflower bed by the picnic area is doing well, many flowers are out already. The trial wildflower beds by the lower bridge have not worked well. We tried laying cardboard down over the grass to make it die down and covering it with compost into which the wildflowers were sown. Any suggestions to increase success would be very welcome! All shrubs that were planted two years ago are developing, some better than others which probably reflects the very variable nature of the soil and amount of rubble deposited from the nearby War Tunnels. A program of keeping the immediate area around the trees and shrubs clear has been maintained. Plants have been raised and are steadily being sold. We had a stall at La Houguette School Fete and nearly 100 plants went. This year we have provided Mongolian Giant plants as they should capture the imagination of younger and older entrants alike – flowers can be nearly half a metre wide! This has been planted out again this year, although it is not on the judging route. This is an important part of the history of our parish and we wish to continue maintaining a floral presence here for visitors to enjoy. Lots of hard work on the Sensory Garden! Repair of the pergola in the Sensory Garden? We have agreed to support a Green Legacy initiative to train school teachers to hold lessons outdoors, this has been identified by Ofsted as a good way to increase children’s learning, social and personal skills when planned well. We will pay for one teacher from La Houguette School to attend the course, provided by the Council for Learning Outside and to be held at Queux Patio, at a cost of £250. As you may be aware, one of our Floral St Saviour Team is Ali Benfield, a Teaching Assistant at La Houguette, and Ali has been instrumental in creating the footbridge in the nature area. Ali wants to add a Willow Hide this year and the Parish is donating further money to assist in this project. The Floral St Saviour sponsorship of a teacher to take the ‘Bring learning to life’ course will support this project. 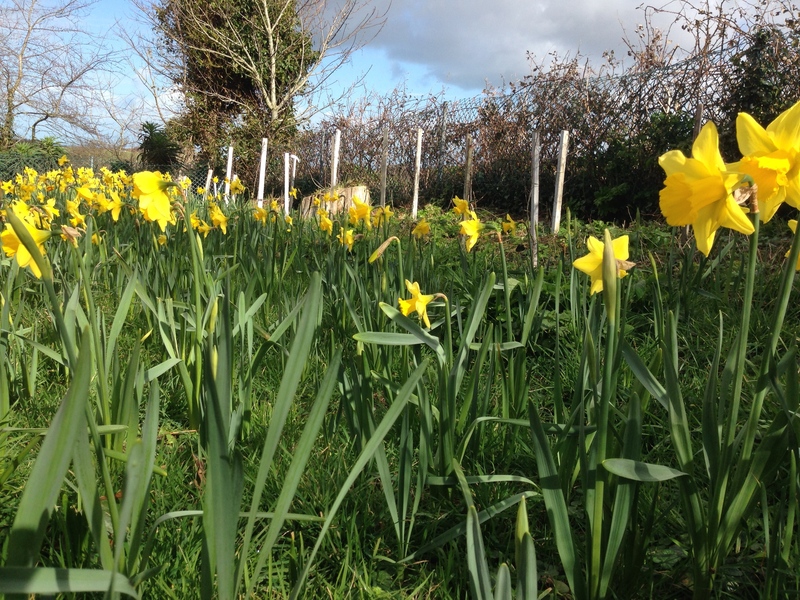 Daffodils in the field are well in bud now, flowers will be appearing very soon! Layton will also rebuild the brick planter that Environment are insisting be reduced in size – volunteers needed to start removing bricks and cleaning them up please! 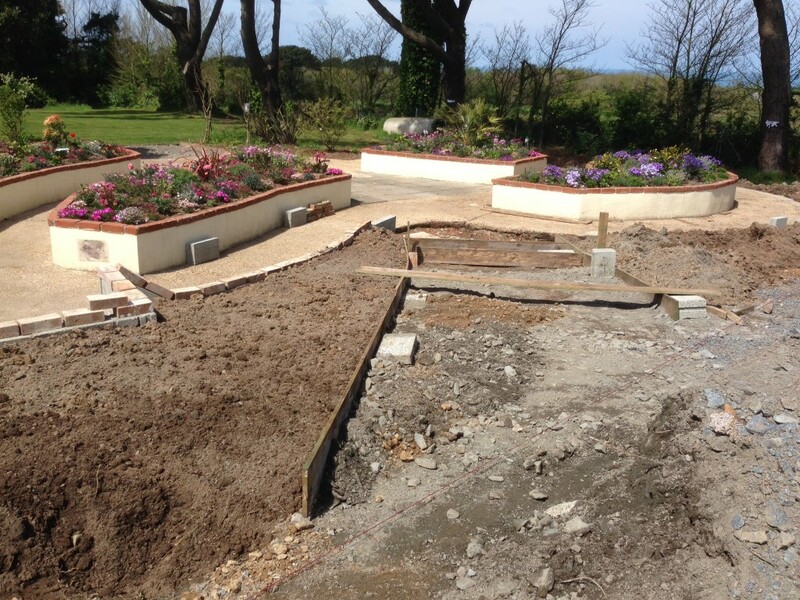 Sensory Garden work has progressed superbly in two main areas, there are still some that could do with attention though! Two trees have fallen in the last couple of months as a result of very wet ground conditions loosening roots and strong winds blowing the trees over. We are considering whether we can create a couple of seats out of the large tree that has fallen and may leave some of it in place to provide interest and a wildlife habitat, not to mention a natural climbing frame for younger visitors! As we all know, funds are tight and there are none available from the Community Centre itself (all being used to renovate the internal structures). The long bed that we want to create between the WI hut and the store (old toilet block) will be expensive to create if we pay someone to do it and we also need to pay for materials. We propose creating a raised border edging for the bed by recycling the patio slabs that were removed when the old wooden classroom was demolished opposite the WI hut. This means that we will only need some people power to dig a foundation trench and about £150 to pay for concrete in which to bed the upright patio slabs. 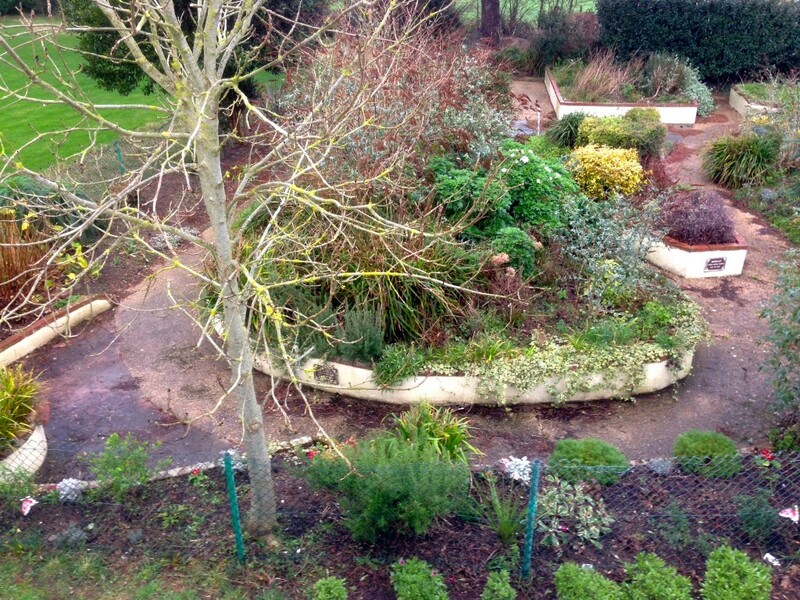 A working party be held on Saturday 23rd February at 10:00 to work on this bed. Tools required will be spades, shovels, spirit levels.